Hey everyone! 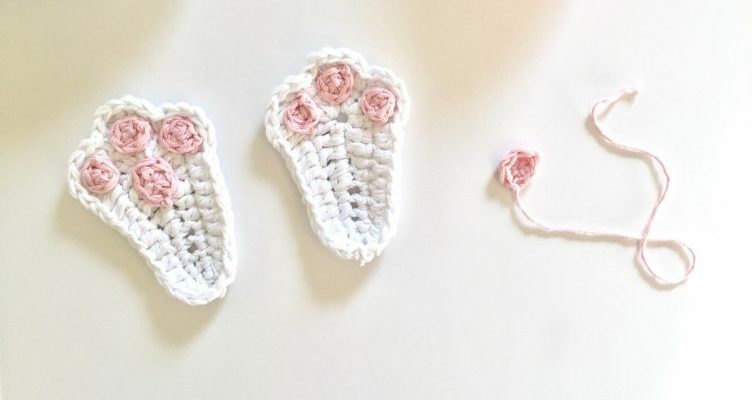 Lori here again with another fun project. Easter is just a hop, skip and jump away and today I’m going to show you how to get your door prepared. This tutorial is going to show you how to create the perfect wreath for the season. 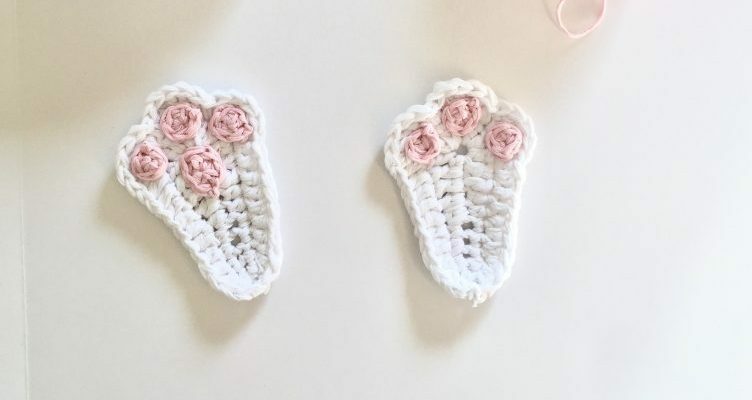 First I’m going to show you how to create an adorable set of bunny paws to add to your wreath. Holding your white Diva Natural Cotton yarn double stranded start with a Ch 10. In second CH from hook place 1 SC. SC in next 3 CHs. HDC in next 2 CHs. DC in next 2 CHs. Place 7 DC in last CH. Working down the opposite side of your CH, Place 1 DC in the next 2 CHs. HDC in next 2 CHs. SC in the remaining 4 stitches. Do NOT join. Place 2 HDC in first SC of previous round. HDC in the next 8 stitches. Place 5 DC in the next stitch (this will form your first ‘toe’). SC in next stitch. 5 DC in next stitch. SC in next stitch. 5 DC in next stitch. HDC in next 8 stitches. Place 2 HDC in last stitch. Slip stitch to first HDC of round. Cut yarn and weave in ends. Now to begin the ‘Toe Pads’. This is what will really make your paws pop! Starting with a magic ring. CH 1. Place 5 HDC into magic ring. Slip stitch to first HDC. Cut yarn leaving a long tail to sew onto your paw. 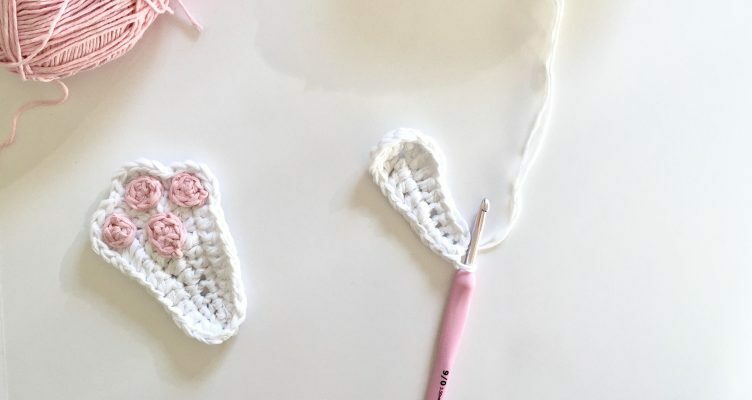 Sew one ‘toe’ pad onto each ‘toe’ hump that you made. Weave in ends. To create your large pad, start with a magic ring. CH 1. Place 2 HDC and 4 DC into the magic ring. Slip Stitch to beginning HDC. Cut yarn leaving a long tail to sew onto paw. 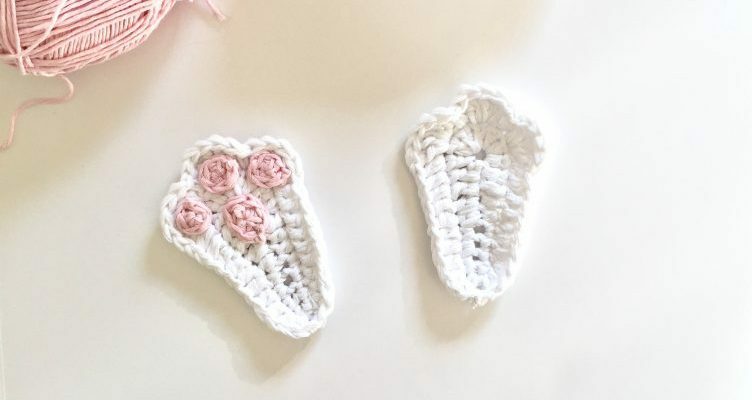 Sew larger pad below the smaller ones in an oval shape. Weave in ends. TADA! You now have an adorable bunny paw! Create as many as you want to attach to your wreath. I will be adding 3 sets of paws to my wreath. 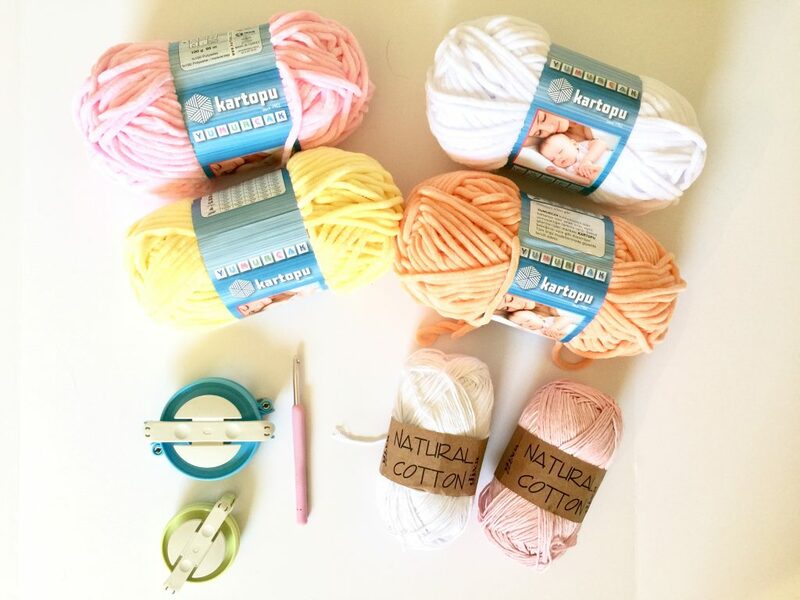 Now lets make some pom poms! 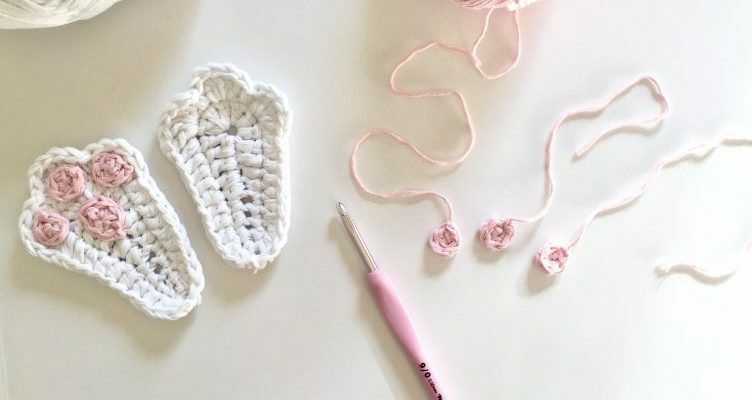 You can make your pom poms with any method that you prefer. 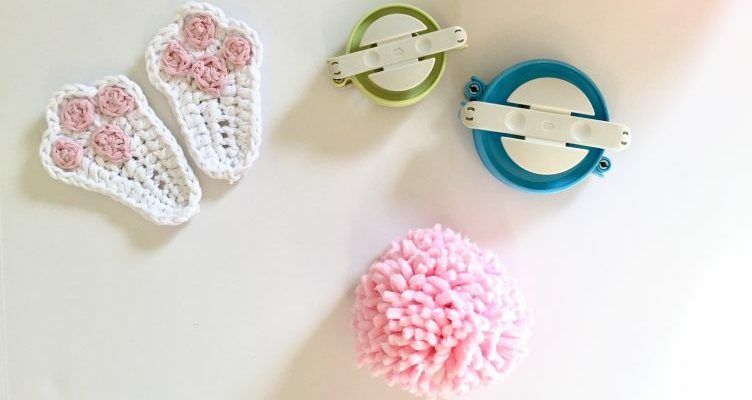 I will be showing you how to create Pom poms using my favorite Clover Pom Pom makers. 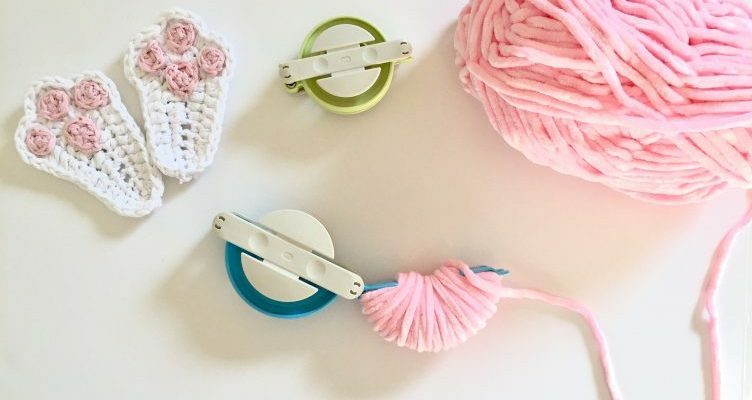 Start by wrapping your yarn around one side of your pom pom maker. Wrap until there is no more space. This will give you your biggest and fluffiest pom poms. Shut the first side of your pom pom maker and open the other. Wrap your yarn around the empty side just as you did with the first side. 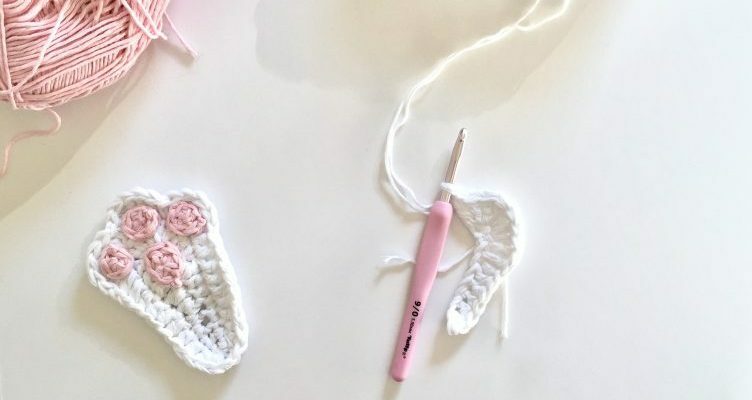 Feel free to be creative with your pom poms. you can hold two different colors together for a duo colored pom. Once your happy with the way your pom is wrapped, closed the other side and cut your yarn. Cut a long piece of yarn. 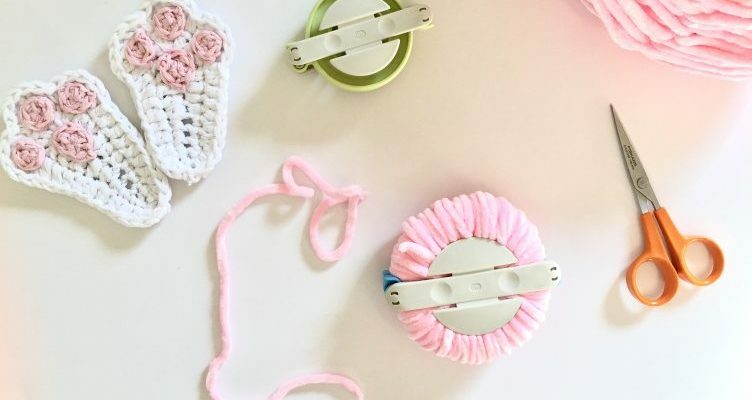 Cut along the grove that your pom pom maker has until all your piece are cut in half. 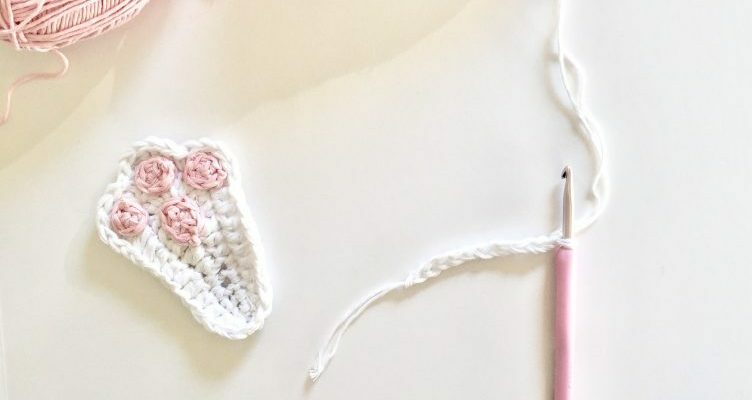 Tie the long piece of yarn that you cut tightly around the center to secure your pom pom. 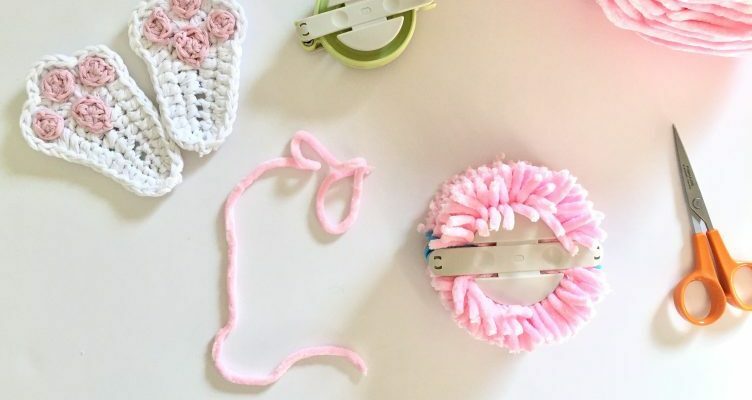 Open your maker and pull it apart to reveal your fluffy pom pom. Shake your pom pom to fluff it up even more, and trim any long pieces. Continue this process, alternation between large and medium pom pons to give your wreath some variety. Now it’s time to put it all together! 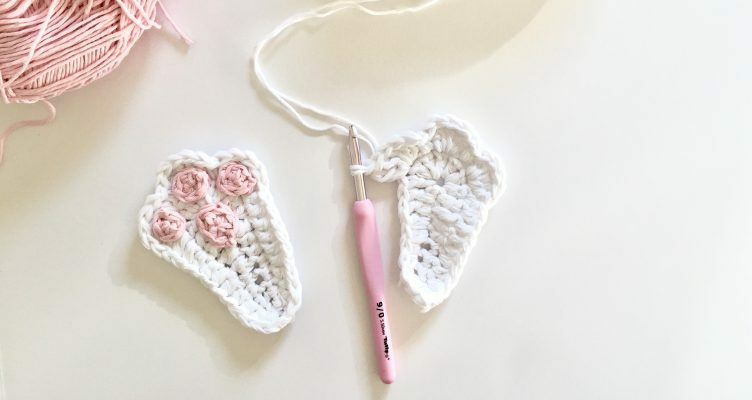 Grab your hot glue gun and get ready. Start by attaching some string to the top of your wreath form for easy hanging later. Gather all your supplies and go to town! 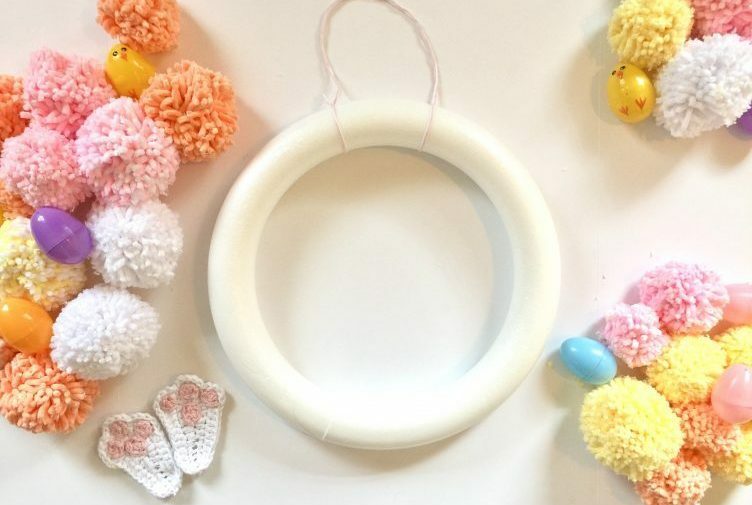 Use your hot glue gun to attach your pom poms, eggs and paws to the wreath form. 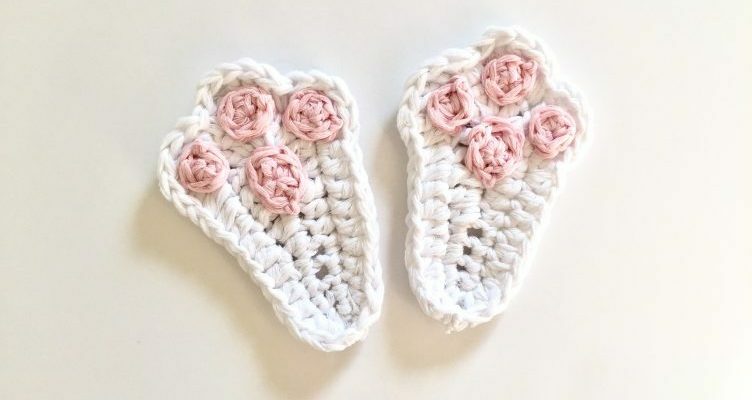 Have fun and be creative with this step! 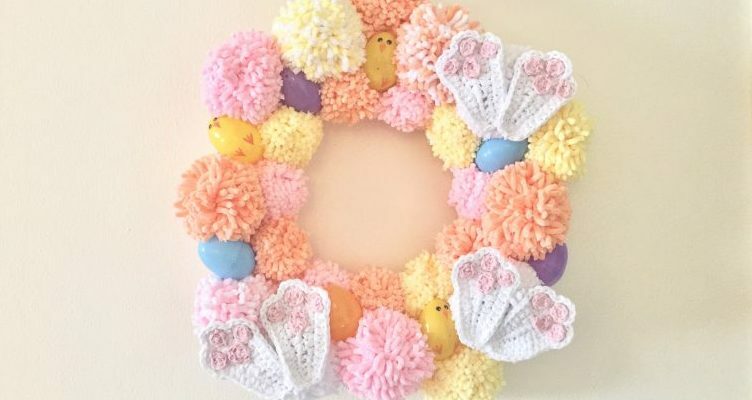 I hope you enjoyed this fun easter project! Be sure to share your pictures on instagram!